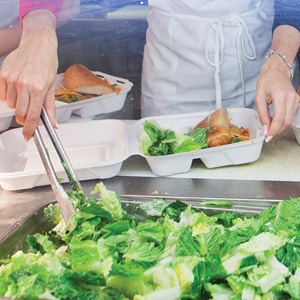 The Hamilton Lawyers Feed the Hungry program began operating in February 2018. This program partners with Mission Services in Hamilton to serve meals to those who are vulnerable and hungry within the Hamilton community, particularly children and families. The program sponsors meals bi-weekly operating out of the Mission Services Community Kitchen, servicing 80-100 people per sitting. Twice each month, the program covers the cost of the meal service, as well as provides the necessary volunteers to set up, serve the meal, and assist with clean up. Our volunteers represent a cross section of the legal community including lawyers, the judiciary, courthouse staff and other stakeholders. Together, we aim to help reduce hunger in Hamilton and make our community a better place. Volunteers shifts take place from 2:30 p.m. to 5:30 p.m. on the second and last Wednesday of every month. For more information about Hamilton Lawyers Feed the Hungry, to volunteer or support the program, please contact Nigel Smith, Interim Program Director, at NSmith@hughesbale.ca or 905.523.5252. 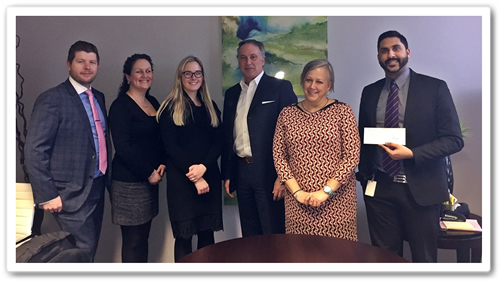 Hamilton Lawyers Feed the Hungry is deeply grateful for the tremendous ongoing support of Ross & McBride LLP and their recent donation of $20,000 received February 11th, 2019 as part of the Firm's Project Benevolence|365. Each year, the Partners at the Firm allocate a portion of net profits towards benevolent actions; to champion and support groups, organizations, events and causes in the Hamilton Community. Through Project Benevolence|365, members of the Firm are empowered to take intentional action, each and every day, to care about and for others in the workplace and the community, building personal and organizational awareness and by providing positive leadership through corporate philanthropy. On October 30, 2018, the Hamilton Lawyers Feed the Hungry program hosted a Halloween Fundraiser entitled “Get Spooky”. The event was attended by members of the local Bar and legal system. Attendees enjoyed food, drinks and collegiality within the community. The program received donations to further develop the Lawyers Feed the Hungry Program in Hamilton. We thank all who attended and supported the event. On May 8, 2018, the Hamilton Lawyers Feed the Hungry program was nominated as recipient of the Lawyers Who Care project in Hamilton. Imran Kamal presented to the panel and Hamilton Lawyers Feed The Hungry was chosen as a recipient charity. Hamilton Lawyers Feed the Hungry is grateful for the gracious donations of all involved in the Lawyers Who Care Project. On February 1, 2018, the Hamilton Family Law Bar held Groundhog Day 2018, an evening filled with laughs, drinks and collegiality. Groundhog Day is an old Hamilton Family Law Bench and Bar tradition in which family law lawyers and judges are ridiculed and mocked in the name of charity and a good time. This year’s event raised money for Hamilton lawyers Feed the Hungry. We thank the Hamilton Family Law Bar for their generosity and support.